Missouri United Methodist Church, in Columbia, Missouri like many churches in Missouri makes the Upper Room daily devotional guide available to church members in their literature racks. This MissionCast tells a little about the Upper Room devotional and how you can join millions around the world by using the Upper Room as your daily devotional guide. 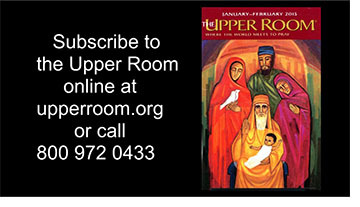 You can subscribe on line at upperroom.org or by calling the Upper Room at 800 972 0433.